Just make sure you get the picture BEFORE you help him up. I say; If you don't have a slinky...a nerd works just as well! OOH! A piece o' candy !!!! This is so staged. That pretty boy in the blue silk didn't want to muss his hair. Wait a second...do you here that ?? OMG IT'S MY BUSS COMING!!!!!!!!! 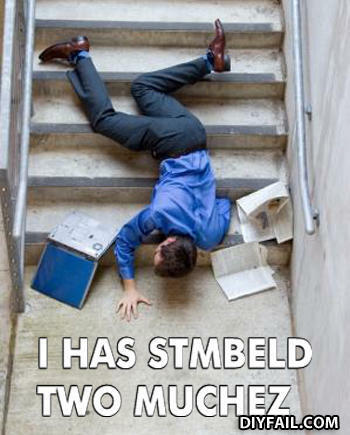 I told you about those stairs bro. He's the author of "Falling Down Stairs for Dummies". Get your copy now on Amazon..
People are like Slinkies. They're stupid. But its fun to watch them fall down the stairs.